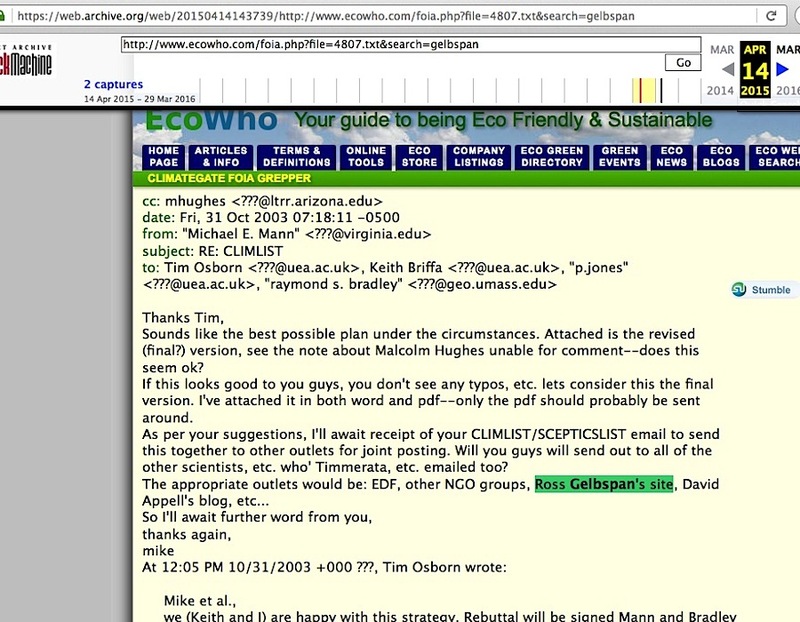 Why is Ross Gelbspan’s Name Found in ClimateGate Emails? 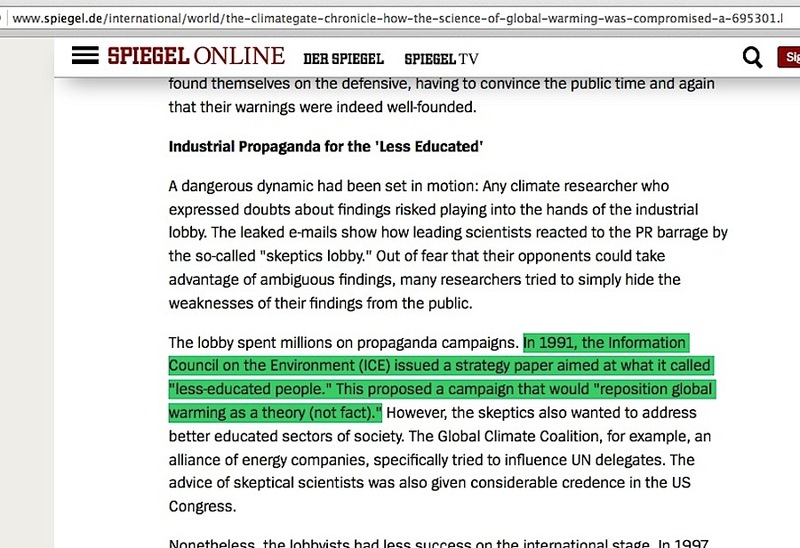 Pick randomly among the thousands of ClimateGate emails, and you see discussions among IPCC scientists about finely detailed climate science matters. 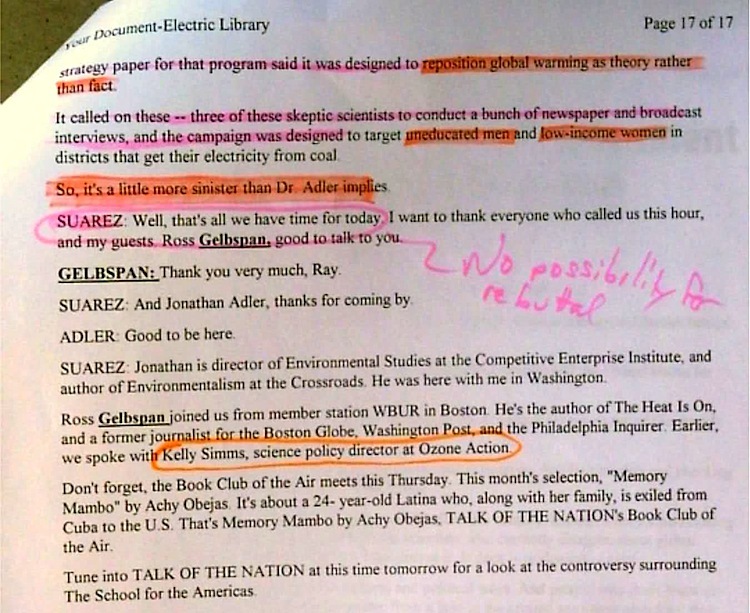 So why is a non-scientist like Gelbspan found among those discussions? 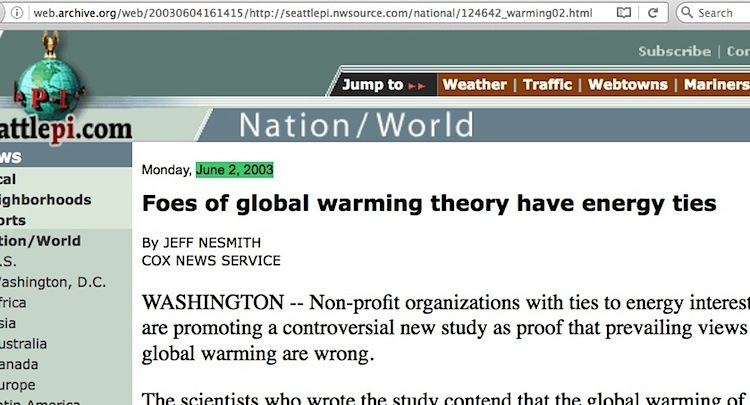 Let’s take a brief look through a few ClimateGate emails and items they refer to. 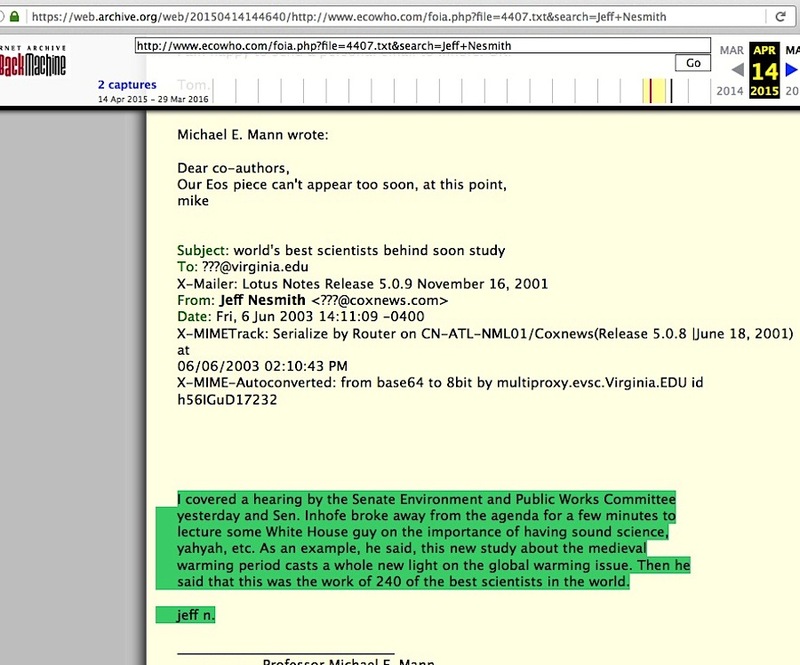 In this October 31st, 2003 email by Michael Mann to his fellow IPCC scientist Phil Jones and others, he speaks of alerting various organizations to news of a rebuttal to the McIntyre and McKitrick 2003 paper which had become quite a problem for Mann’s central work. 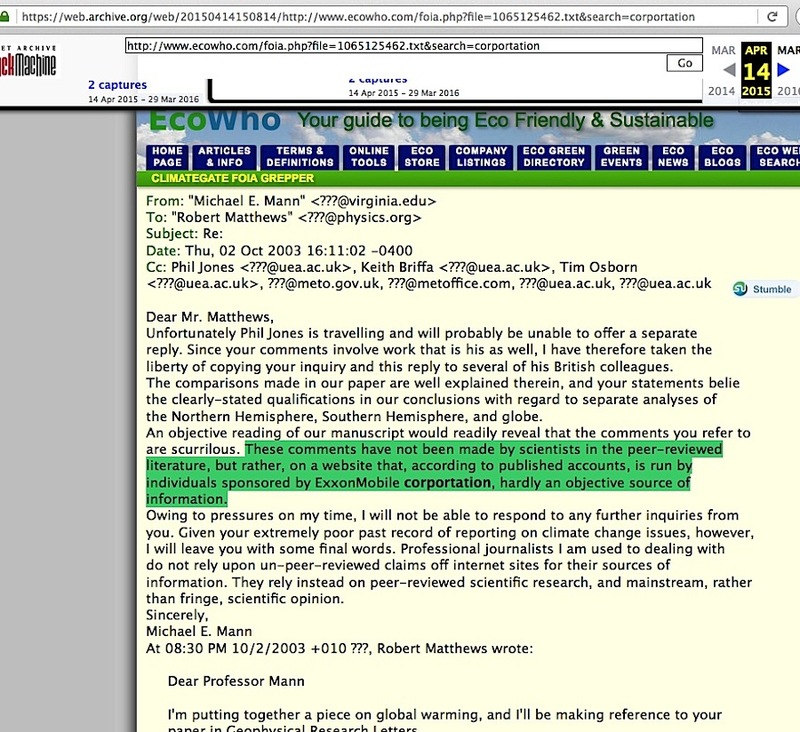 Just days before this email, Michael Mann sent one to IPCC scientist Stephen Schneider and many others on how to deal with the McIntyre / McKitrick problem. Who is among the IPCC scientist recipients? Ross Gelbspan. 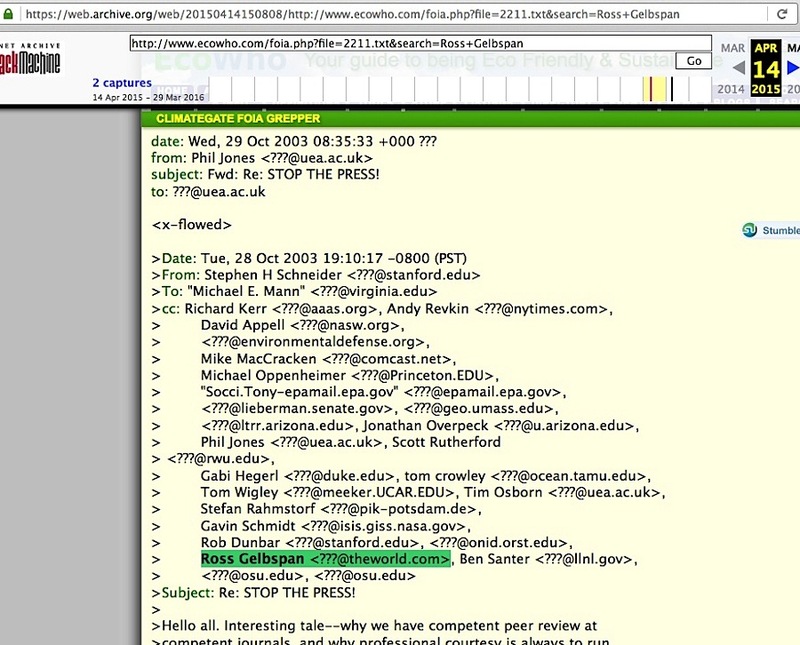 Although Gelbspan’s name isn’t displayed in Mann’s outgoing email here preceding Ben Santer’s, it is caught in Schneider’s reply. The name would be no surprise to Schneider – he described Gelbspan as a Pulitzer winner in end note #8 of his 1996 “Laboratory Earth“* book. [*12/21/17 Author’s addition: Interesting how that GoogleBooks preview has now vanished. Hence the reason why I used the prior screencapture photo of when it did function.] Don’t forget the big problem with that “Pulitzer winner” label. 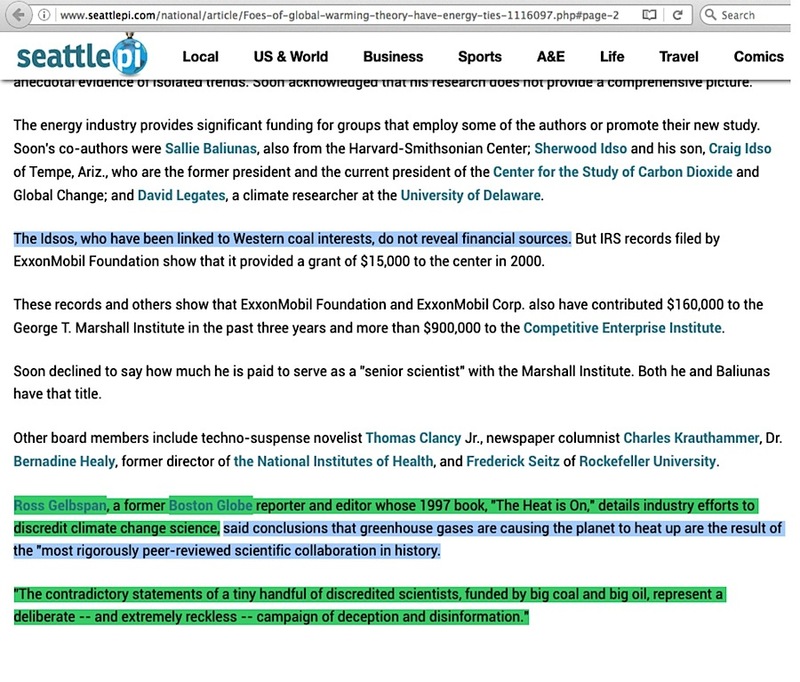 These comments have not been made by scientists in the peer-reviewed literature, but rather, on a website that, according to published accounts, is run by individuals sponsored by ExxonMobile corportation, hardly an objective source of information. The Idsos, who have been linked to Western coal interests, do not reveal financial sources …. 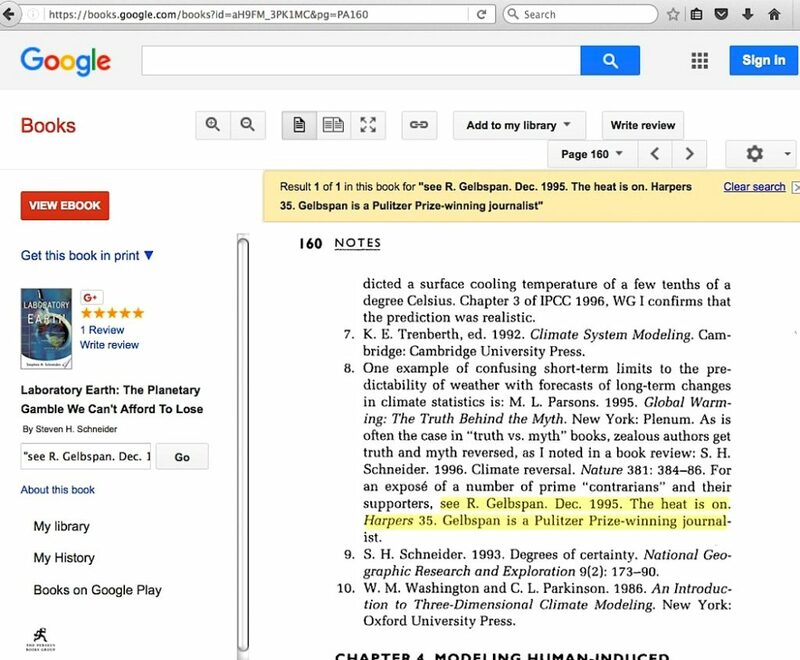 Ross Gelbspan, a former Boston Globe reporter and editor whose 1997 book, “The Heat is On,” details industry efforts to discredit climate change science, said conclusions that greenhouse gases are causing the planet to heat up are the result of the “most rigorously peer-reviewed scientific collaboration in history. 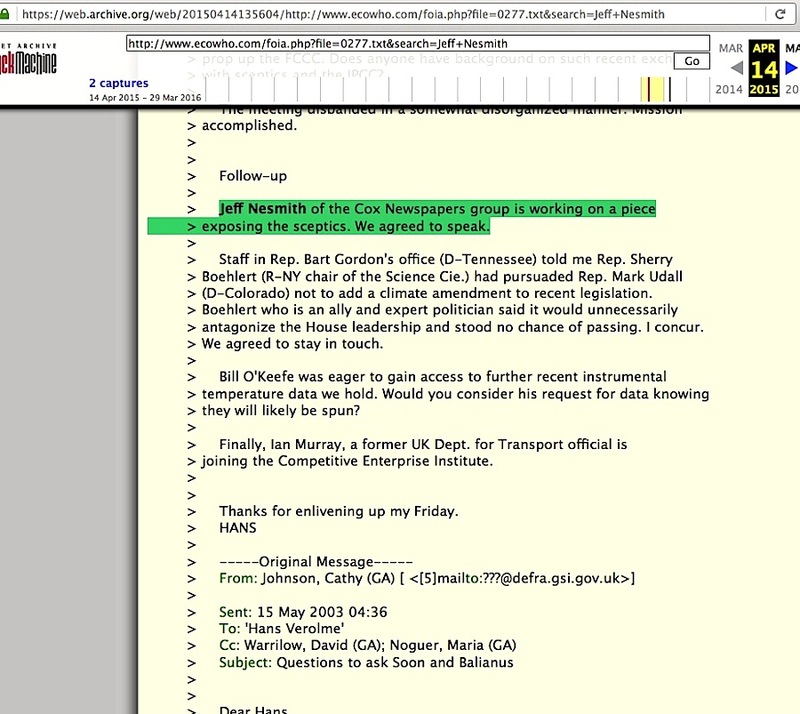 Mere days after Nesmith’s article appeared, Dr Mann forwarded an email Nesmith sent directly to him to his fellow IPCC scientists, about an item relating to the Soon / Baliunas paper and Oklahoma Senator James Inhofe. Need I remind my readers that the phrases above ostensibly stem from just one source? Forget the proverbial “six degrees of separation” here. 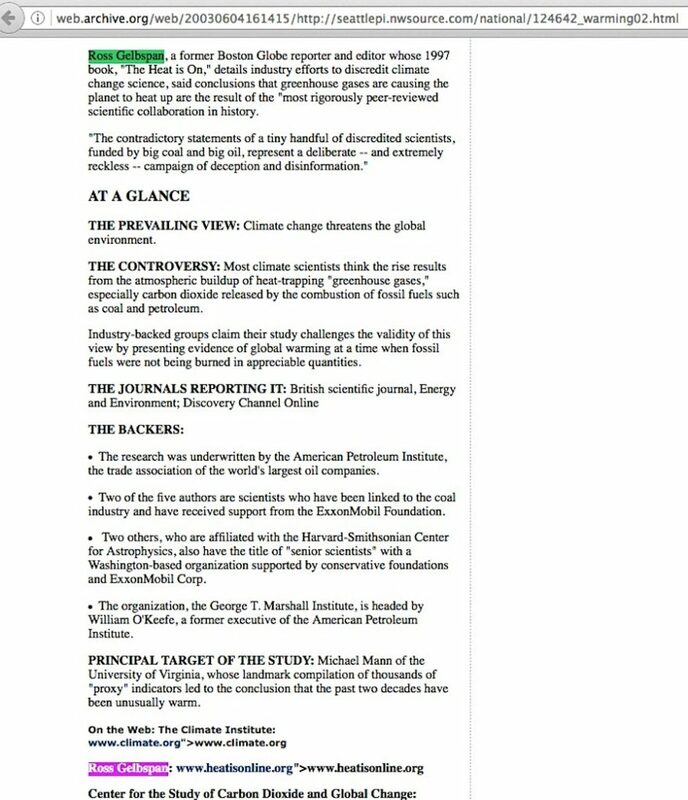 Journalists ought to ask themselves why any narrative pushing the idea of skeptic scientists being corrupted by industry money seems to be separated from Ross Gelbspan by three degrees or less. And a large portion of the public should why the media never apparently noticed this problem. 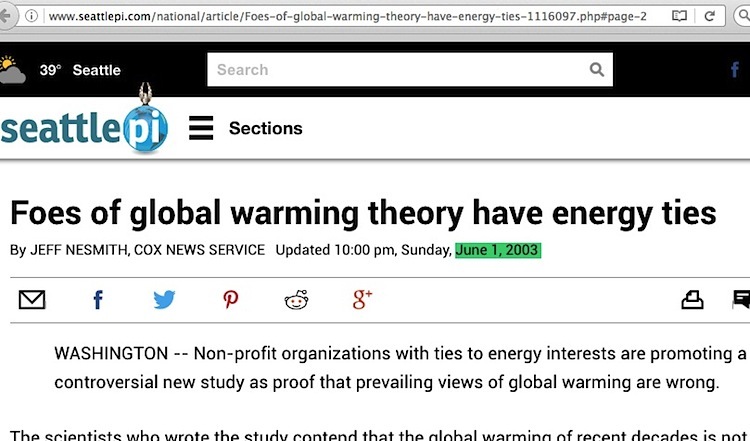 This entry was posted in ClimateGate, Three degrees of Separation or Less and tagged Jeff Nesmith, Michael Mann, Phil Jones, Stephen Schneider by Russell Cook. Bookmark the permalink.